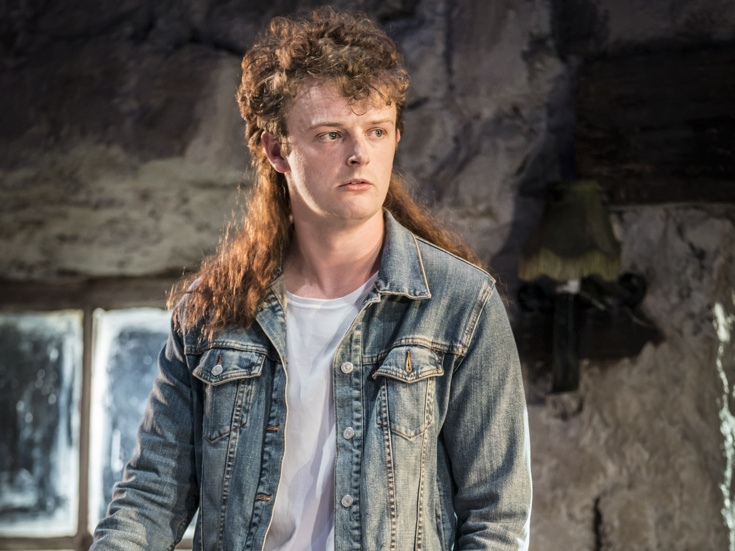 Chris Walley in "The Lieutenant of Inishmore"
Professional stage debuts rarely come more auspicious than the bravura turn of 23-year-old Irishman Chris Walley in the current West End revival at the Noel Coward Theatre of The Lieutenant of Inishmore, starring TV’s popular Poldark, Aidan Turner. Martin McDonagh’s play, here directed by Michael Grandage, casts the recent drama school graduate as the hapless if endearing Davey—a part that brought its Broadway originator, Domhnall Gleeson, a 2006 Tony nomination. Small wonder the delightful Walley couldn’t believe his good fortune when Broadway.com caught up with him for a chat. Weren’t you connected to this production well in advance? I was. I had three rounds of auditions and got it at the last round, so I knew I had the part of Davey from last November but wasn’t able to tell anyone until months later. And I didn’t know Aidan [Turner] was the lead until the public knew it. That was a surprise! Were you as pleased as so many of us were to discover that Turner has genuine theatrical chops and is not just a TV heartthrob? That was apparent even in the readthrough: Aidan is an incredible, incredible actor. He makes it look so easy that you forget how hard his job is; here he is playing this psychopathic character with so many redeemable traits that you can’t help but love the man. Were you nervous toward the outset to be in such distinguished company? There’s always an element of nerves, but I did come in [to rehearsals] very well-prepared. Michael [Grandage, the director] likes everyone to know their lines before they start, and we had five weeks rehearsal, which is loads of time when everyone is off book. At the first dress rehearsal, I had my entire class in from drama school, but everyone in the cast is so kind and lovely that the nerves just dissipated. Did you already know Martin McDonagh’s darkly funny 2001 play [seen on Broadway in 2006]? I was a massive fan of Martin’s work and had obviously watched a lot of his films, but this play was actually one of the few of his that I hadn’t read. As soon as I read it, I fell in love with Davey. It’s such an amazing piece! What do you think of Davey, who doesn’t half succumb to (admittedly hilarious) bad luck? The thing about Davey is that he lands himself in this absolutely mad situation where he finds this dead cat that belongs to “mad Padraic” [Turner’s character, a take-no-prisoners terrorist]. Davey then gets blamed for killing the cat and keeps digging himself into this worse and worse hole. The play is an absolute roller coaster. Is it hard to sustain the tone of the piece? What’s brilliant about Martin’s play is that the stakes are so high that nothing is funny for the characters, no matter how funny [the situations] may seem to the audience. Did you have to give yourself a physical makeover for the role? You couldn’t less resemble the “slightly overweight” character indicated in the text. That’s true, but nor did Domhnall Gleeson, who played Davey on Broadway. Martin actually said to me early on that he’s never had an actor as Davey who looked the way he originally intended but that it doesn’t matter. What the play does give me are two wigs and the chance to dye my hair ginger, which I actually really like. I look like a proper Irishman now [laughs]. Like Gleeson, who was also 23 when he did the part on Broadway, does it feel odd to be playing a teenager at this point in your life? Well, I played a 16-year-old in [Irish screen comedy] The Young Offenders, so I guess I just look younger than I am. Let’s see how long I can pull that off! Speaking of your starry antecedent in this role, has Gleeson made contact with you? He has, you know. I reached out to Domnhall and he sent me this lovely, lovely email that says so much about someone who is willing to open themselves up. He hasn’t been to see us yet but I believe he might be coming in soon. How did Michael Grandage find you given that you were still training at London’s prestigious RADA when you got the part? I was in a version at RADA of a Strindberg play called Easter that Michael came to see. The play was adapted and directed by Titas Halder, who had been Michael’s assistant, so when Titas found out I was auditioning for this play, it made everything so easy. It was all the best kind of coincidence. Given your director’s track record with musicals like Frozen and Evita, do you think you might get the opportunity to sing on stage in one of his shows? Well, we all studied singing at RADA but I don’t think you’ll be seeing me in any musicals. I don’t consider myself a singer. How do you interact with the cats that are so important to the play’s ever-surprising story? We have two and they tend to come in quite late, at which point we get an announcement over the loudspeaker, “Wee Thomas is in the building!” People like to go down and visit them, but I always forget they’re there. I should really try and do better on that front. As the production goes into its final stretch, are you continuing to pinch yourself at the good fortune that has come your way? Of course, I do that every day! I often find myself going, “Jeez, look what I’m doing; this is mad.” The thing now is to continue to try to take the bull by the horns and to see what’s next. I just want to keep working as hard as I can.